We woke up to gorgeous beautiful sunshine! After eating breakfast and getting ready we headed to the center of town where the Astronomical Clock is. This is a big attraction at each hour when the clock goes off and does a sort of "show". There is a busy town square area here. We were just thrilled with the sunshine. God blessed us with beautiful bright bright sunshine! Woohoo! We climbed the clock tower for gorgeous views of Prague. This climb is not bad at all. Hopefully I have at least one frame-worthy shot! You can see the climb back down. It's easy because it is mainly ramps you walk up. There is also an elevator if you aren't up for walking. Next we walked over to the Charles Bridge which isn't too far. We found out it was closed due to the flooding. It seemed a bit odd since the water was still well below the bridge but for whatever reason it was closed. This had attracted a decent sized crowd of groups and tourists. Although you could certainly tell that the river was higher and that things surrounding the river were partially underwater. We started making our way walking along the river toward the tram that would take us up toward Prague Castle. Stairway down into the muddy water anyone? We bought tickets and hopped on the tram which made several stops on its way up to the castle area. We walked through part of the castle area looking for a lunch place we read about. We stopped to have lunch at Panorama Pergola, recommended by the Rick Steves book, perched on a hill below the castle with picturesque views of Prague. They even had their own little vineyard on the hill. They had delicious wine and panini's. And took a million bagillion photos. Don't worry I won't post them all here :) Such postcard looking scenery! A ledge made a great tripod in a snap. Then we bought tickets for the Prague Castle. We opted for the "short tour" ticket which include many of the buildings and the main castle part but not everything. First we went to the Old Royal Palace. And then to the Cathedral. They did allow photos inside the Cathedral. We saw a nave in there where the King used to go to mass in his pajamas. Sounds awesome to me. After the castle, we convinced begged the boys to go to the Toy Museum with us. In here there were old barbies and all kinds of other old toys. Some were easily recognizable and others were very strange. Did I mention the boys are completely terrified of dolls? 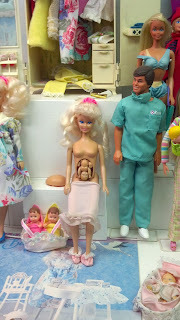 Preggo barbie was also strange. That was not a barbie that I personally owned. Thankfully a doctor is nearby. We saw a Clemson barbie in the college collection! Here's something for the guys. By this point we had worked up an appetite again and decided to take the tram back across the river. And walked to a nearby ice cream shop. After eating ice cream we decided to walk back over to the Charles Bridge to see if it was open or we could find out when it might open back up. Once we arrived at the bridge I reached in my crossbody bag pocket for my phone and it was missing. I searched through my stuff and everyone's frantically but it was gone. I had just been taking photos of the ice cream shop with it so somewhere in between that and the short but busy with people walk to the bridge, it was stolen. I hadn't been keeping it in the outside pocket normally but had stuck it there quickly while eating ice cream. It was pretty upsetting considering it was only a year old and had so much on it. And no I didn't have the find my phone feature. Luckily we had been backing up my photos from it (and my camera although I lost the phone photos from that day) each night but I had never backed up or gotten icloud or anything for my contacts. I also lost my detailed notes I had taken throughout the trip for the purposes of blogging later. I tried to recreate a good bit of them but it still wasn't 100%. Sigh. And who wants to buy a new phone. So my advice is not to be paranoid even though pickpocketing etc. is fairly common there but to just be super vigilant and purposeful about where you put your belongings. It is sad this is common as I wouldn't worry about having my phone in a bag pocket in any U.S. city. So there you have the worst part of an otherwise great day. After that we went back to the apartment so I could cancel all my phone stuff so the person couldn't access anything of mine. That evening we headed to La Boca, a tapas restaurant I had read about online. The lighting was very low so I had a hard time getting good shots of the food but trust me it looked yummy just like it tasted. 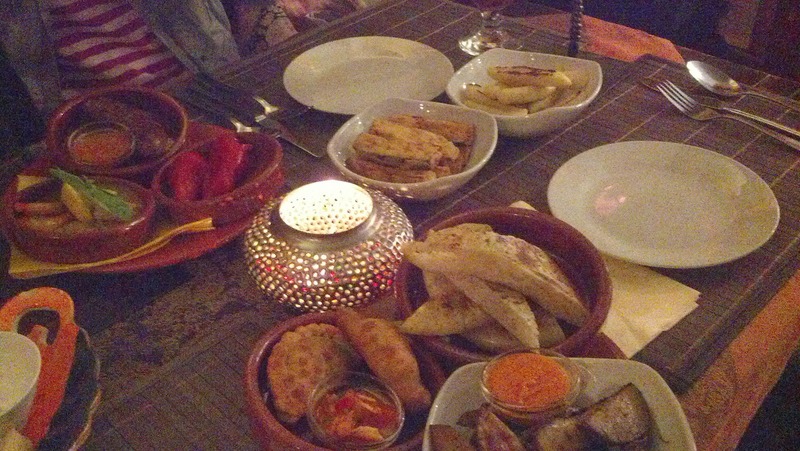 We ordered a bunch of different delicious tapas and sides including feta cheese filled peppers, sausage, potatoes, shrimp, gnocchi, breaded zucchini, empanadas and Greek bread. And to brighten my spirits after having my phone taken, we had LOTS of sangria! Definitely needed! We really enjoyed La Boca! La Boca was not too far from the Palladium Mall (with the grocery store and near the bank from the first day) so we went there after dinner to find dessert. Most of the places in the mall were closing so we grabbed cookies in the grocery store to finish off our night. Whew, that was a long one! Hope you hung in there and stay tuned for our day trip to Nizbor... definitely filled with adventure!